The "Holy Face" of Gemma -Jesus living in her. The incredible look and regard of Gemma! It is as if the holiness of her soul radiates through her face and appearance, but even moreso it was Jesus living in her, and the love of God that radiated through her face and eyes. This is a common statement and reflection of those who gaze upon the photos of her. 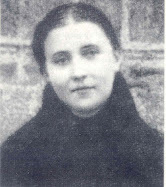 Having read numerous biographies and personal accounts of those who knew St Gemma, there are several common traits of this Saint that are consistantly mentioned by those who speak of her. One of these would most surely be her unforgettable look and smile that literally captivated those who gazed upon her. 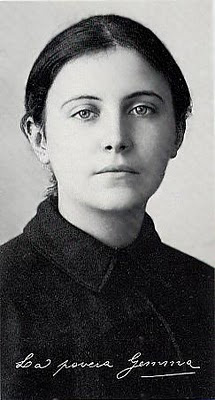 "I knew Gemma Galgani by sight, as several times I found myself next to her in long waits at the confessional of Monsignor Volpi. I did not personally meet or speak with her, because our families were not related. 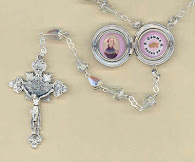 I knew she was a poor girl of whom the Giannini family took in out of charity, and that she received a grace from the Blessed Margaret Mary Alocoque [referring to Gemma's miraculous cure -Editor] . And a friend once told me about her: 'She is a cold chicken. If you put her here, she stays here, if you put her there, she stays there'. " "One day, by chance, I saw her smile, and the charm of that smile struck me, and I always have it in mind and heart. During Gemma's Beatification, on the day which the Church officilally declared her blessed, while reading the decree for the heroicity of virtues, the Holy Father, Pope Pius XI, stated that the little virgin of Lucca had "bore in her flesh the wounds of Christ." "What has happened today is something greater and more remarkable than what ordinarily happens. It has come about in God's own way. He exalts the humble and makes them first in His Kingdom." "I can see her once more before me, dressed in black, wearing her mantellette, not very tall, light of step, almost silent, with a transfigured face, with sweet and soft large eyes made to see immortal things. "Comparing my recollection of her person, which I keep alive and present in my mind, with her portrait, I find my recollection to be true. That face, luminous and peaceful, remains and will remain in my mind and heart as the face of a saint. Who would have thought at the time, when a heated controversy was waging around this girl, and people alternately sided for and against her - even though her virtue was ever held in high esteem - who would have thought of today's triumph and of the great things Divine Providence reserves for tomorrow?" 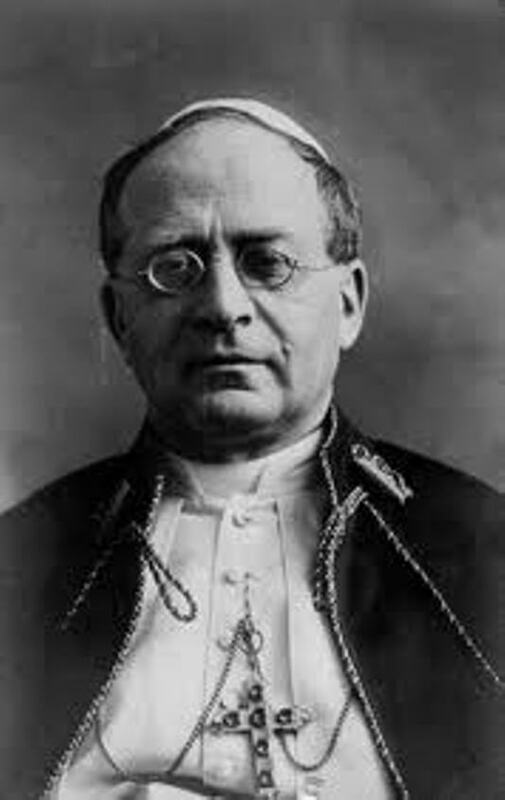 -Words of Pope Pius XI. "My feelings on that occasion, still vivid in my memory, baffle explanation". -Ven. Father Germano, C.P. In 1900 in a ecstatic vision, Jesus showed Gemma the priest who would soon be her spiritual director. It was Father Germano Ruppolo C.P. who was at that time the Postulator General of the Passionists, an archaeologist, an author, and a well respected director of souls. Following Jesus' request, she wrote to him a long letter explaining who she was along with some details about her spiritual life. For his part, Father Germano ignored Gemma's letter, and did not respond. It was at a time during which God was granting Gemma with an ever increasing amount of mystical graces, including the stigmata, the crown of thorns, ecstasies and private revelations. Her confessor since childhood, Monsignor Giovanni Volpi, the auxiliary Bishop of Lucca, felt the need to seek help in the spiritual direction of Gemma, and he therefore asked Father Germano to come and interview Gemma. As we shall read below, Father Germano was not interested in meeting Gemma, and advised Monsignor Volpi to give Gemma and exorcism! "...in August, 1900, through my Provincial, he [Mons. Volpi -editor] invited me to Lucca in order to examine his penitent in person. I, who on principle have always been slow to believe in such extraordinary things, replied advising him not to attribute too much importance to what was happening [with Gemma] but rather to put his penitent on the ordinary path pursued by the majority of the faithful. He wrote again, giving me some particulars of those extraordinary things, and I, still persisting in my way of thinking, was so far from the reality of what was actually occurring as to suggest to his excellency to have recourse to exorcism. His perplexities increased, and still wishing that I should judge of things in person, he prevailed on the Provincial to oblige me to go to Lucca. I went there on the 1st of September, 1900 and stayed with the Giannini family, with whom Gemma was living. On seeing me, the dear child recognized me at once [because Jesus had shown him to her in a vision -editor], and coming forward to welcome me, she showed great joy, blessing Our Lord in her soul. I confess that, on meeting her, my first sentiments were those of devotion and veneration. We went together and knelt before the crucifix in the family oratory. Gemma wept, and I likewise. My feelings on that occasion, still vivid in my memory, baffle explanation. Our Lord was then assuredly preparing me to see great things by which every shadow of doubt remaining in my mind should be dispelled...."
So what was it in Gemma's face and regard that instantaneously and completely changed Fr. Germano's opinion of her? He flatly states "My feelings on that occasion, still vivid in my memory, baffle explanation". "Today I am no longer in myself. I am with my God; all for Him, and He all in me and for me; Jesus is with me, He is all mine....He dwells in the miserable cell of my heart and His Majesty disappears. We are alone, alone, and my heart beats continually with that of Jesus. -Jesus forever! The Heart of Jesus and my heart are one and the same thing. A moment does not pass without my feeling His dear presence always manifesting Him­self in the most loving way." And many more such quotes from Gemma can be read in the article "heart of fire with the love of God" and elsewhere on this website. 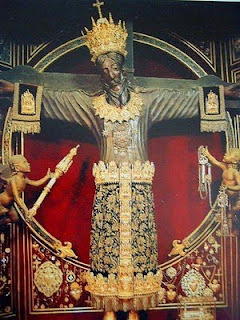 Gemma's hometown of Lucca is known worldwide as the "City of the Holy Face" because of the beautiful and miraculous ancient crucifix in the Cathedral of San Martino. 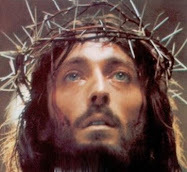 [see article on the Holy Face here]. This extraordinary crucifix called the "Volto Santo" or "Holy Face" in english, draws the faithful from all over to pray and honor this image our Lord, who suffered and died for our sins. Is it not extraordinary then that another lesser "holy face", that of Gemma, should be venerated in this renowned city of the Holy Face! 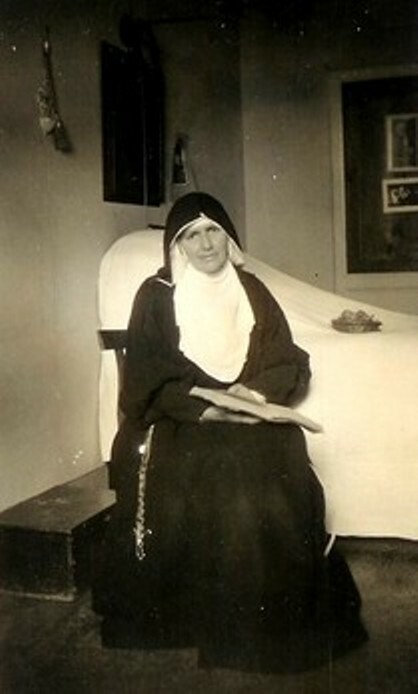 "Oh Mother, pray always to Jesus for me ....Dear Mother, I am not at all well, as you know: my life is consumed. And as to my soul?....Oh, God, I am tormented by wicked and impure thoughts, but Jesus tells me to turn to you, Mother saying, "Daughter, commend yourself daily to her; she will make you beautiful, gentle, amiable, because she can win souls and save them; she will make you tranquil and at peace." And in spite of these words, I lose spirit and cry. I often reflect on the photo of Gemma. Does it seem to you, as it does to me, that her eyes follow you when you move to either side of her? Yes, in the photo Gemma seems to look directly into ones eyes, regardless of the angle it is viewed at. 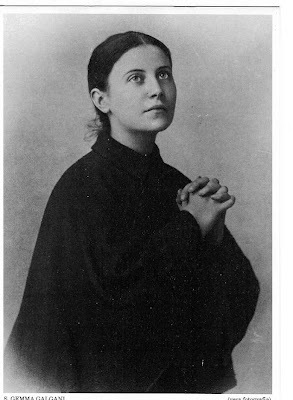 To me her photo radiates love, complete devotion, sacrifice and self-giving...a complete giving of oneself to God, without limits...no half-measures. 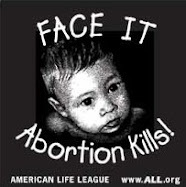 I see the love of God radiating from those eyes. That is what I see when I look at Gemma's photo, and she deeply inspires me. My first impression was ordinary. What I mean is that at a glance I would not have recognized her as a saint. Ironically, however, I keep wanting to look at her face; and the more I look the more I understand how Jesus and Mary are in us, in our ordinariness; and to me, that's extraordinary. And by God's grace, she is and always will be extraordinary.